La Scuola International School, the first Reggio Emilia – IB - Italian Immersion school in the world, will be running a unique summer camp for children ages 3 to 5. Children will be immersed in the Italian Language while applying innovative pedagogy that combines the Reggio Emilia approach with real-world skills. The camp is divided into five weekly thematic units led by early childhood professionals, specialists, and artists-in-residence with years of experience in each one of the weekly thematic units being covered. In addition, children apply the inquiry of the day within an immersive Italian environment, making the use of this new language a tool for fun encounters! Each week is a mixed-aged format for 3 to 5 year olds and must be potty-trained. We are only accepting currently enrolled La Scuola students at this time. Early drop-off at 8:30AM may be available depending on demand. Following last year’s success, our cooking camp is back! Led by local Italian chefs, children will have the opportunity to shop for ingredients and prepare traditional Italian recipes from scratch. Their problem-solving, mathematic, creative, fine motor, and social skills will naturally be challenged as they cut, peel, knead, measure, whisk, and taste the ingredients in our kitchen. During their Italian culinary journey, our little chefs create their own recipe book, which they will share with you at home. Buon appetito! Music is the rhythm to life. This summer, children will explore musical skills that will serve them in the classroom and beyond. Students will develop active listening and social-emotional skills and mindfulness through musical activities and games. Through inquiry, children will investigate sounds in everyday material and objects, as well as combine found sounds to traditional music. Join us as we dig into the vast richness music has to offer! Awaken your senses and be prepared to be inspired by nature’s gifts! 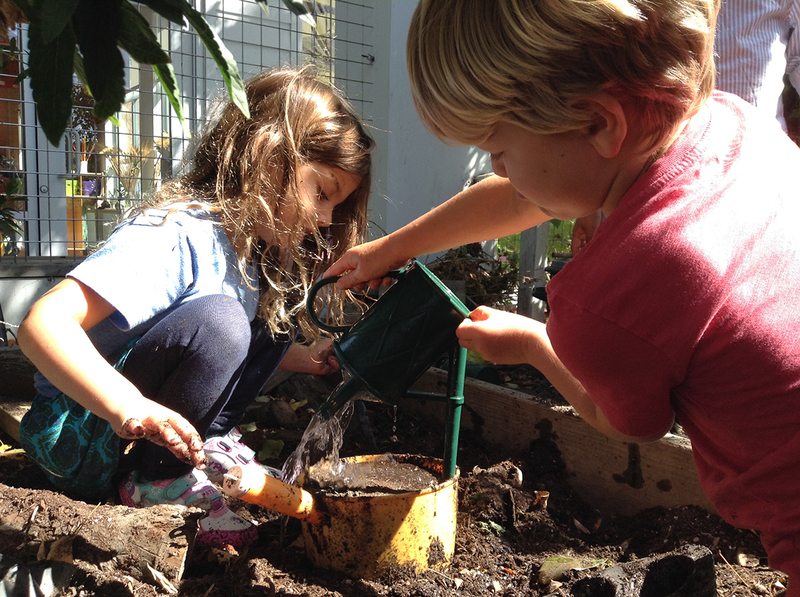 Children are immersed in the magical world of the garden as they dig, plant, and observe the cyclical aspects of nature. Our study of the garden empowers children to build their knowledge through inquiry of the natural world for a deeper and more cohesive approach to learning. This journey will circle us back to healthy eating and sustainability as well as developing the very important value of patience. Take a journey back through the ages! This week’s camp will hone children’s instincts as we explore the use and textures of clay, mud, sticks, stones, and pebbles. A natural segue from "In My Garden" summer camp, children learn how to identify the basic elements of art from form, color, shape, pattern and texture to apply innovative art techniques and make their own masterpieces! Science and technology are at the heart of our changing world and it is important for children to be exposed to it early. Science will come alive with our hands-on activities, facilitated by our robotics teacher. Throughout the week, our little scientists will use different materials to develop their fine motor skills and sensory stimulation. From setting up a colorful chemical laboratory, mixing our own solutions, playing with the laws of physics, to programming robots, we will embark on a journey through science and technology by observing, exploring, deducting, and creating.